Fundamental 3-D properties of magnetic turbulence observed in the magnetosheath are reported, thanks to measurements by ESA's Cluster mission close to the magnetopause. These properties are of prime importance to model magnetic turbulence in the magnetosheath, which plays a key role in the dynamical coupling between the solar wind and the magnetosphere. Their consequences are also relevant to astrophysical and laboratory plasmas. This new scientific breakthrough on magnetic turbulence by Cluster is published today, 24 February 2006, in Physical Review Letters. The Earth's magnetic field is our line of defence against the permanent flow of particles coming from the Sun: the solar wind. Thanks to the Earth's magnetic field, most of this solar material gets deflected around the Earth's magnetosphere, delimited by a boundary layer called magnetopause. Like for any other magnetised planet (Jupiter, Saturn, ...), the solar wind is in fact first decelerated from supersonic to subsonic speed by a shock wave (called bow shock), located in front of the magnetopause. 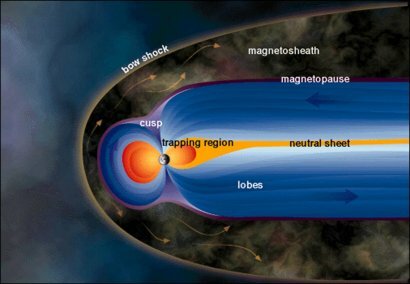 The region between the bow shock and the magnetopause, characterized by very turbulent plasma, is called the magnetosheath (Image 1). Characterising the properties of the magnetic turbulence occurring in this region is of prime importance to understand its role in fundamental processes such as mass transport, energy dissipation and magnetic reconnection (a physical process which enables a small fraction of the incoming solar wind to sneak through the magnetopause). On 18 February 2002, the four satellites of the Cluster mission were crossing the magnetosheath close to the magnetopause when they simultaneously detected a high level of magnetic field fluctuations (Image 2). The four spacecraft were flying in tetrahedral formation at about 100 kilometres distance from each other, hence the similarities between the measurements obtained by the different satellites. By conducting a multi-point analysis of these fluctuations, a team of European scientists reports 3-D properties of magnetic turbulence, observed in the magnetosheath close to the magnetopause, and compare them to present turbulence theories. Here is a brief summary of their results, published by Dr. Fouad Sahraoui and co-authors in today's issue of Physical Review Letters. What can be done without using the unique capability of the Cluster mission to provide simultaneous measurements at different points in space (here closely located)? A standard way to analyse such magnetic turbulence would be to compute the power spectrum of each time series obtained by each spacecraft. The power spectrum indeed provides information on the scales and processes by which the energy is injected, transferred and dissipated in the system. Image 3 displays the low frequency part of the spectra computed for each spacecraft. As one can see, all spectra roughly follow a power law f-7/3 in the initial range (here for f ≥ 0.11 Hz). By analysing each spacecraft individually, temporal fluctuations can not be distinguished from those due to the crossing of spatial structures. More specifically, each individual spectrum provides information at frequencies in the spacecraft frame fsc. This frequency mixes spatial and temporal information since it is actually the sum of the frequency fv in the flow frame, and the Doppler shift fD: fsc = fv + fD (for a unique wave vector, fD = k · v/2π, with v the plasma flow velocity vector and k the wave vector). If we now take advantage of the simultaneous measurements at four points in space closely located, a wealth of new information is then accessible. In particular, the k-filtering (a multi-point analysis technique making use of the 12 components of the magnetic field measured) allows estimating the spectral energy density in the full 4-D space (fsc, k), in other words: how the energy is spatially distributed for each frequency fsc. 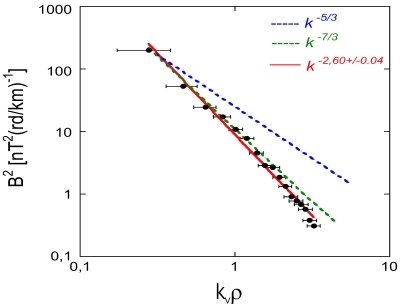 For a given frequency, the maximum of the energy density in the k space is looked at (as illustrated in Image 4). The frequency fv of this maximum is then estimated. If fv ~ 0, then the "wave" is actually a stationary structure. 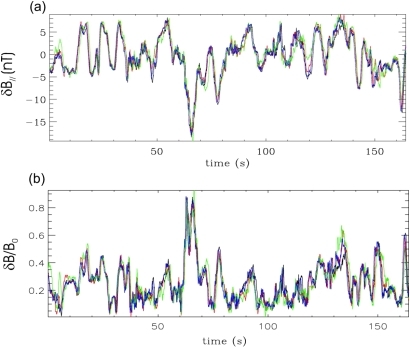 Application of the k-filtering technique to all frequencies in the inertial range leads to the following result: the turbulence is composed of stationary magnetic structures in the flow frame, with spatial scales decreasing with increasing frequency. These structures are very anisotropic and compressive. "K-filtering applied to Cluster data in the magnetosheath provides a picture much more complete than ever before of how the energy of magnetic turbulence is spatially spread near the magnetopause boundary", writes Dr. Fouad Sahraoui, scientist at Centre d’Etude des Environnements Terrestre et Planétaire, IPSL/Centre National de Recherche Scientifique (Vélizy, France) and lead author of this article. A key experimental property to be compared with turbulence theories is the scaling which describes how the energy is transferred across scales in the inertial range (Image 5). A power law close to kv-8/3 is found. "This power law is steeper than all those predicted by the existing MagnetoHydroDynamic-like theories", adds Dr. Sahraoui. A new picture emerges to describe this turbulence: its energy is injected at large scale (~ 2000 km) and cascades non-linearly down to the smallest scale estimable by Cluster (~ 150 km) following a new power law in the inertial range not predicted by any turbulent theory. These results obviously trigger new theoretical studies and improved numerical simulations to better model the magnetic turbulence observed. Other possible applications of this new scaling law are proposed. For instance, this new scaling law could be used as a new input for turbulent models aiming to explain fast reconnection in astrophysical plasmas. "Thanks to its unique ability to distinguish between spatial and temporal effects, the Cluster mission is inaugurating a new era in the study of turbulence, both in the magnetosphere and in the solar wind", underlines Philippe Escoubet, ESA Cluster project scientist. 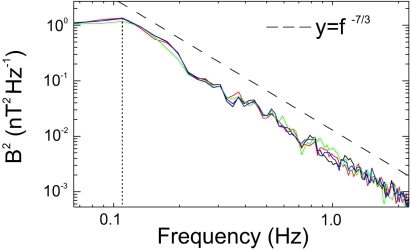 Sahraoui, F., G. Belmont, L. Rezeau, N. Cornilleau-Wehrlin, J. L. Pincon, and A. Balogh, Anisotropic turbulent spectra in the terrestrial magnetosheath: Cluster observations, Physical Review Letters, 96, 075002, 24 February 2006. Fouad Sahraoui, Centre d'Etude des Environnements Terrestre et Planétaire, IPSL, 10/12 avenue de l'Europe, 78140, Vélizy, France. Arnaud Masson, SCI-SH division, RSSD, ESA, The Netherlands. Philippe Escoubet, SCI-SH division RSSD, ESA, The Netherlands.